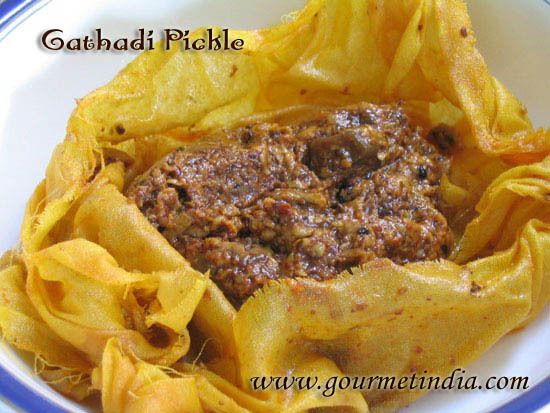 Thadri, a festival celebrated by Sindhis, 7 days after Rakhsabandhan, to please Goddess Jog Maya, is a day to consume cold (cooked a day ahead) and pro biotic foods like yogurt and pickle. It is similar to the Shitla Ashtami and Basoda festivals where generally the lady of the house cooks food like Lola, koki, paratha etc and the next day the whole family is supposed to consume the cold food. While many people write off this tradition as regressive, there is some science involved here, to support the rituals, to some extent. Without engaging into a debate of right or wrong, I am sharing the recipes and rituals for Thadri festival, since I am finding it hard to reply individually to everyone inquiring about it. Please note that traditionally everything was cooked on a kerosene stove and that stove was not used on Thadri to cook anything (ie. it was kept cool). Since it is a time consuming process hence nowadays food for thadri is cooked on a gas stove and you can use kerosene stove just to cook lola. Some people cover the burner of gas stove that was used to cook lola and on Thadri nothing is cooked on that particular burner. You can use other burner to cook tea, milk etc, or satvik food for those who cannot eat cold food for the whole day) Do whatever works for you! To make dal paata phulka, rinse well and soak moong dal for an hour. Drain and roast slightly in some oil in a pan, add salt, turmeric powder and green chillies (optional) and boil in some water till al dente. Drain if there is any excess water. You can add a tempering of cumin seeds, coriander powder and red chili powder and add some amchoor too. Cool properly and use this to make stuffed parathas, the way aloo parathas are made. 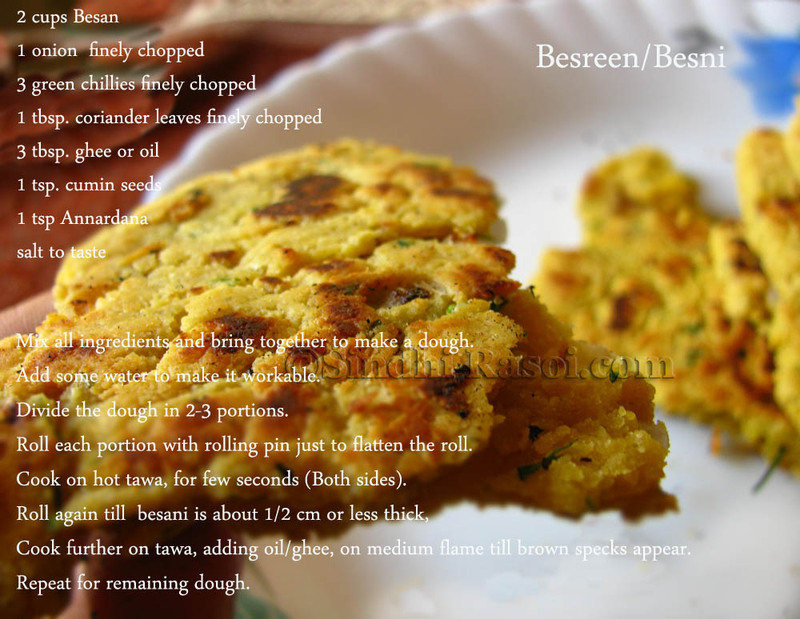 Around 1 cup of cooked dal is needed to make 4-5 parathas. Also some people make fried lola (rottah), ghach or chautha, literally meaning the quarters (sweetened maida or atta dough, rolled and cut into quarters, fried and sprinkled with powdered sugar on which some hot ghee/oil is poured) and satpura (layered, fried, crispy puris made from maida) too. Here is how you can plan to cook the whole meal with ease. The day before Thadri, in the afternoon, mix sugar/ jaggery in water and mix it well. Keep it aside. Soak Mung dal, chop onions, green chilies etc for koki and besani. Peel garlic for subzis. Gather all the ingredients to make green chutney (Coriander leaves, chilies, mint, tamarind, garlic, ginger, cumin) in a bowl covered with cling film and refrigerate. 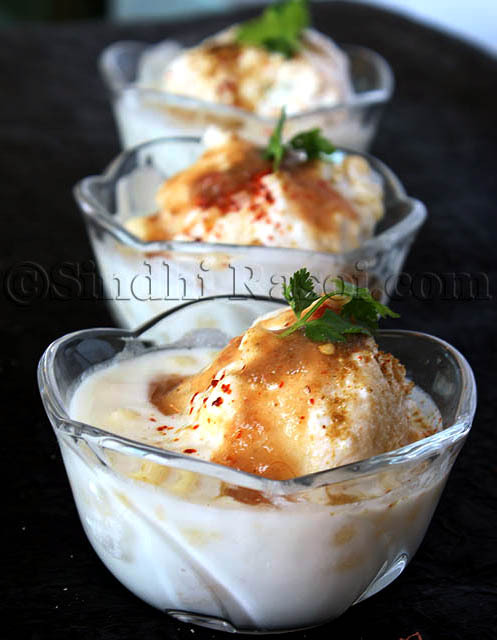 If you wish to make dahi vada, then soak urad dal too. 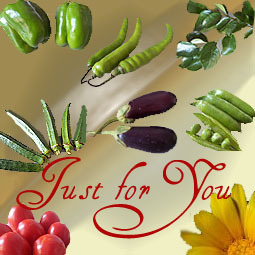 Mostly dry subzis like methi, karela dhaas, bhindi aloo etc are also cooked along with mirchi pakora. So if you plan to make all these, simply clean a bunch of fenugreek leaves and peel bitter gourds, make a slit (lengthwise) and add salt. 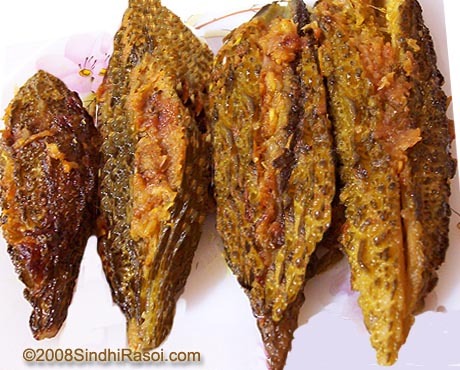 Similarly, slit the bhavnagri mirchi (or the chilies that are thick and are used for pickles or fritters) lengthwise and stuff a mixture of salt and amchoor (or lemon juice) and keep aside. Then go ahead and take a nap, if possible. To begin the marathon cooking, start with boiling mung dal (to be stuffed to make parathas) till it’s just cooked but not mushy (al dente). Add spices to it and let it cool. Prepare stuffing for karela. Knead the dough for parathas and let the dough rest for a while. Knead the dough for koki and besani and start cooking. Please be patient and cook these on medium flame. Do not cringe on oil/ghee. Make sure you boil enough of milk if you wish to set the yogurt at home. Boil some potatoes and beetroot too and buy some fresh sliced bread so that you can make veg sandwiches (without toasting bread) on Thadri. While Koki/besani is being cooked, you can start cooking subzis like methi aloo, stuffed karela, bhindi aloo etc. 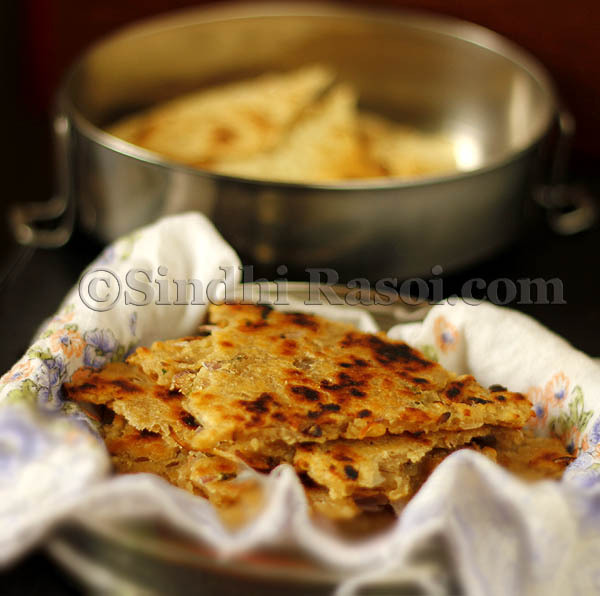 Using cooked moongdal, make ‘dal paata phulka’ or the stuffed dal parathas. Grind urad dal for vadas (bhalla). Fry in batches and keep aside to cool. Make the batter for coating mirchi pakodas and fry pakore till golden brown. Make green chutney. Now using the sugar syrup, knead the dough for lola. Reserve some dough to make 3 lolris and 7 akhris (explained below). Cook lola on medium to low flame using generous amount of oil/ghee. 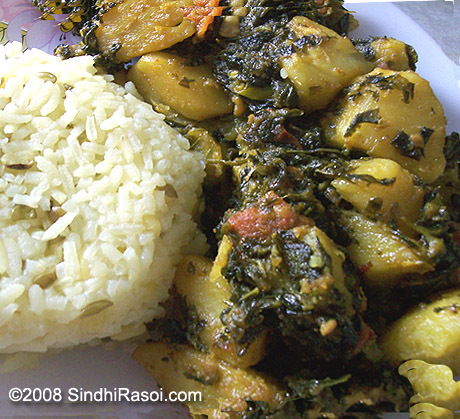 Once you are done with cooking lola, place a mud/clay plate; daangi and cook akhryun and lolryun using the extra dough that you have reserved after making lola. You need to divide that portion of reserved dough into 7 lemon sized balls and 3 slightly bigger ones. The 7 akhryun are rolled between palms and slightly pressed while the 3 lolryun are rolled into small discs. Cook all these on the hot mud plate and keep aside in a bowl and cover it well. In absence of a mud plate you can use a tawa but make sure that you do not use it on Thadri for cooking anything. When you are done with cooking, carefully sprinkle some water on daangi to cool it. Some people switch off the flame after sprinkling water, while some do so prior to sprinkling. If there is any water remaining on the daangi, drain it. Place some raw rice and sugar (akho) and keep it covered. Let everything that you have cooked, cool down properly and then place everything in suitable containers. As a common rule, Lolas are kept in a separate container, while koki, besani and dal paata can be kept together in one container. Pack subzis, vadas, mirchi pakoras in airtight boxes. You can refrigerate vadas, boiled potatoes and beetroot, green chutney but everything else need be kept outside at room temperature. Set the yogurt before sleeping. 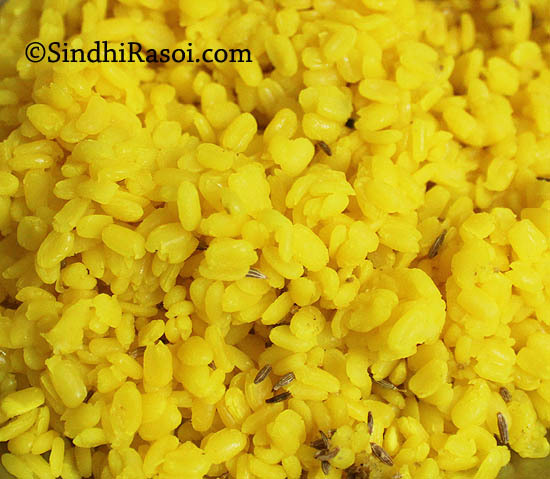 Soak a handful of chanadal and rice, in water either at night or do so early morning on Thadri. Next day i.e on Thadri, the lady who has cooked Lolas needs to follow the rituals. After taking a bath (preferably with cold water), wearing the same clothes that she had worn while cooking, needs to carry a lota (made of steel, brass or copper) and place this lota on the stove/burner that was used to cooked the lola and apply some kumkum. 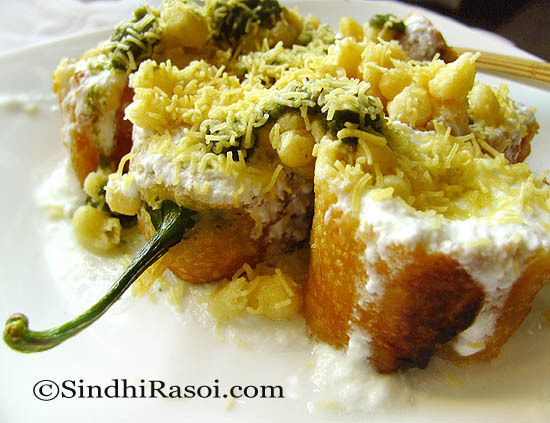 Placing the akhryun and lolris on a plate, a dot of dahi and kumkum is applied on each. But we refrain from applying kumkum on lolris due to health reasons. ” Hik seeyar, bha seeyar, tey siyar chaar, laakhro saakhro , nandhi maayi, wadi maayi, langhaye paar, mai maata je aadhar”(this is a prayer, for requesting Goddess of fire to save the family from the wrath of diseases like chickenpox, measles and mumps). You have to do this thrice with your left hand and thrice with your right hand. Also a portion of this enclosed in your fist, is made to touch the closed eyes of each family member. This mixture is then immersed in any water body/ river, along with daangi, on the day following the Thadri. One lolri is given to any girl child, the other, to a cow and the remaining one is distributed as prasad among family members. Once the rituals are over, the family can have the cold food. Soak vadas in water and then add to the beaten curd. 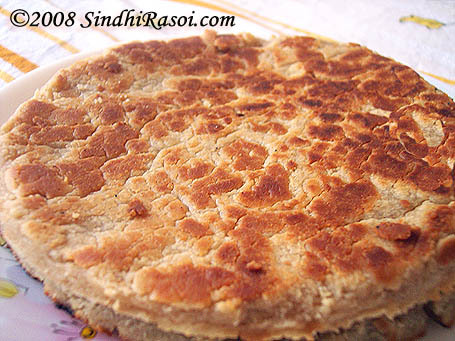 Try to consume parathas in the morning and the other stuff later on, since parathas tend to spoil fast. You can also make veg sandwiches and chaat in the evening . Don’t forget to share some food with your friends or neighbors :-).